In 2011 we joined quite a number of reading challenges. It was both exciting and difficult. But we’re happy to report to have successfully completed every one of it. On Wolves and Fairy Tales: “Beware of the Storybook Wolves” by Lauren Child. Compared to my other 2 team mates here at Gathering Books I’m less likely to read a picture book. It’s personally difficult for me to review picture books. I guess with less text I felt there is less to talk about. However, because of this challenge I rather found myself learning how to ‘read’ picture books. 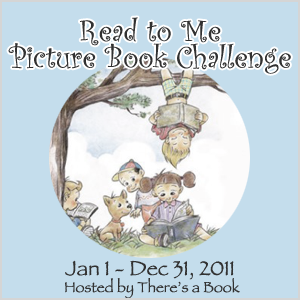 If you want to check out the other picture books we reviewed in 2011 you can click here. This challenge has a funny story. I’m a Murakami fan but by the time we signed up for this challenge I’ve read all of the author’s work with the exception of 1Q84. So Fats and Myra, I felt, would benefit more from this challenge. But it turns out, I read (and reviewed) all the 7 books we aimed to read for this challenge. So, as of today we are officially ranked at: Nakata level. Yey! This challenge introduced me to Anita Desai an author I currently love and whose books are piling up waiting to be read on my shelf. For this challenge, in 2011 we are officially South Asian Adventurers. There is an incredible sense of accomplishment typing the round up for all of our challenges. I’m happy to say that in spite of our worries we made it through. How did you do this year? Were you able to accomplish all your reading goals? Yay! Congratulations to us indeed! Indeed, congratulations – that’s a lot of books read and world travelled from your armchair! Thanks for taing part in the PaperTigers Challenge – I hope you’ll be joining us this year – I’ll be posting it next week.